We’ve just had a break in shooting The Big Sleep. It seems Mr. Hawks has gotten the transcript of Tuesday’s Home Theater Forum live chat with Warner DVD representatives, and he can’t wait to share the big news about forthcoming titles with stars Humphrey Bogart and Lauren Bacall. A disinterested Louis Jean Heydt is on the sidelines, having already announced that he’s sticking with his laser disc collection. Bogie’s expression betrays his excitement over WB exec George Feltenstein’s promise that Halloween 2006 will bring the DVD release of all those 30’s horror titles we’ve been waiting for --- Mask Of Fu Manchu, The Walking Dead, Mad Love, and Mark Of The Vampire. "Hey, Betty", he says, "Look at this! They’re even coming out with The Giant Behemoth, Queen Of Outer Space, and lots more of those long-awaited Allied Artists sci-fi titles folks have been asking about!" "But don’t overlook that Prisoner Of Zenda collection", warns Mr.Hawks, "…all three versions!" His secretary there in the corner (her name’s Margaret Cunningham, by the way) has just noticed those Norma Shearers on the promised list, and another film noir box --- and what about those silents! The Big Parade, The Crowd, Show People, lots more --- and the early Warner Doris Day titles are on the way too. 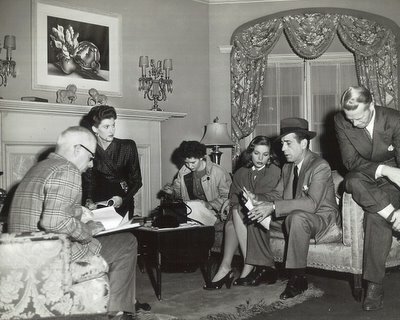 Bogie’s still flipping through those Q&A’s, his hands trembling with anticipation. "Here’s a Gangsters 2 box, and more of my pictures in the pipeline…and here’s a Cagney box, and a Bob Mitchum collection. Wow! No wonder Warners is considered the hands-down best DVD producer in the business!" "Well, that’s something we can all agree on", says an avuncular Howard Hawks, "…guess there won’t be any more work getting done on this set today. Let's all send Warners an e-mail congratulating them on the terrific job they're doing, with our assurances that we’ll be first in line to purchase all those great DVDs on Warner’s 2006 release schedule!" The above flight of fancy reflects our heady excitement over what looks to be the biggest DVD release year so far for those champions of classic movies over at Warners. Under the leadership of veteran disc producer and historian George Feltenstein, this company has set a standard of quality unsurpassed in the industry. Warner’s ongoing annual status as DVD Producer Of The Year has become a foregone conclusion. No one comes close to their level of quality and commitment. If you’d like to read the transcript of this week’s live chat, here’s the LINK. So many great titles are forthcoming, not to mention all those great short subjects that are part and parcel of most Warner DVD releases. Each new box set arrival is like Christmas morning here at the Greenbriar. Keep up the great work, guys! Thanks for the transcript link John - fascinating read. BTW, The Big Sleep is one of my faves. Isn't "The Giant Behemoth" redundant? "The Incredible Shrinking Behemoth" was probably the planned sequel.